These days you hear lots about facebook connect and how it might attack the idea of the open web. While I don’t think that it will be such a danger on the long run just because it’s yet another centralized concept (much like Passport back then) and doomed to go away, there is still something which it makes pretty clear: OpenID right now has a problem in terms of branding and usability. One thing facebook connect does very much right is that it’s an easy to recognize way of logging in. It’s a well known logo and the user experience behind that is implemented very well. Here we see a plethora of options where I am not sure myself really what to put in there for all the options. Putting your openid there works though. Having these many options is undoubtly confusing to everybody but the geek user. it’s again confusing to the user because depending on the site you want to login to you might have different options and providers listed. So what’s happening here is basically that we are doing facebook a favour in doing the divide and conquer for them. Instead we should all gather behind only one brand called OpenID and promote that as hard as possible! If we keep explaining what it is to users they eventually will understand it and will start looking for their own OpenID URL on their social network’s site. They might even ask why there is none. And login buttons only would have one possibility: OpenID and they would know what to put there like they right now know what to put their when being asked for their email address. Again: There really should be one way to login! Everything else will weaken us! There are other problems of course. One is the version problem we have right now. Try logging in with your „yahoo.com“ openid and some sites and eventually you will get an error message saying that no OpenID was detected at that URL. I see that being reported here and then on mailing lists and experiencing this myself. The reason of course is that the RP in that case does not support OpenID 2.0. This of course also does not help our case. 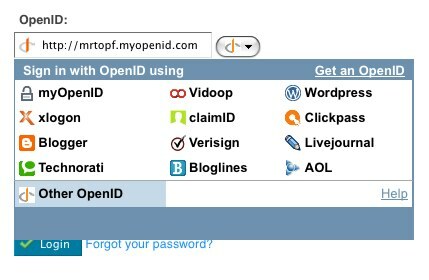 If you know your OpenID you want it to work everywhere. Joe NormalUser does not understand why it’s not working on some sites although they all claim to support OpenID. I am not sure how to solve that problem but I wonder what keeps site from not implementing OpenID 2? Using e.g. JanRain’s libraries seems easy enough to me (at least in Python). Another thing being discussed a lot is whether we want to have some EMail to OpenID mapping eventually making it easier for users to know what to put in that field as they already know what an EMail address is. The problem here is similar to the first mentioned problem though. If we keep saying on the one hand that OpenID is a URL and on the other hand that it is an email address then things gets confusing again. Add to that that not every email address actually will resolve into an OpenID (or URL in general) and people might be confused again. They also don’t know what to ask for. Ask for „I need an email address with which I can login, too“? While I first thought being able to use email addresses might be a good thing I am not so sure anymore. The problem is again that you don’t want to confuse people and gathering behind just one thing which is called OpenID and is a URL and nothing else might be a good thing. Gather behind the term OpenID and promote that. Put pages up explaining what it is if you support OpenID logins or are an OpenID provider! 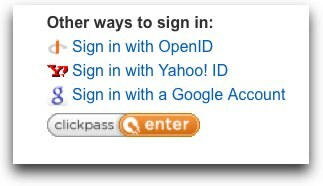 Remove all unnecessary confusion from login boxes and just use OpenID. Update: The OpenID Foundation is in the nomination phase for it’s board election. Why not join the foundation and be an official part of the movement? It’s only $25/year for an individual and you can register here.